Classic Accessories Roanoke Inflatable Pontoon Boat in a view from top side. A pontoon boat is only a special type of small boats. There are many types of boats that can be used for sailing, fishing, practicing sports, taking photography or just enjoying views. It is a hobby that it is growing year by year, and especially from spring and summer, weekends and holidays, are very suitable to enjoy the hobby and become an expert sailor or fisherman on these kind of small boats. A particular class of boats are called pontoons. A pontoon is a kind of boat or flotation surface which has enough buoyancy to float itself. Of course, it should have enough heavy load to carry all the elements necessary for your activity such as fishing tools, camera for photography, meals and clothes among other basic items. Now, having defined the pontoon itself, we should introduce what a pontoon boat is. A pontoon boat basically is a flattish boat that relies on pontoons to float. However, pontoons may also support a platform, creating a raft. One of the most available boat designs are a catamaran with two pontoons, or a trimaran with three. These kind of pontoons can be easily constructed from sealed cylinders. These sealed cylinders can be simply as pipes or barrels, or fabricated as boxes from metal or concrete. The pontoon boat drafts may be as shallow as eight inches, which reduces risk of running aground and underwater damage. The pontoon effect is when a large force applied to the side capsizes a pontoon boat without much warning, particularly a top-heavy boat. A great feature of pontoon boats is that this type of boats for pleasure boating and fishing can be low cost for their capacity, and cheaper to insure than other boats, even when equipped with substantial engines. This is a significant difference when you want to join the world of fishing. Having not only a cheap pontoon boat which is robust and safe but also with a low cost for the insurance really helps to enjoy more the hobby. Here, we mostly focus on relatively small inflatable pontoon boats are one or two man, catamaran type boats, designed for leisure and fishing. For this kind of boats, the pontoons are made out of abrasion resistant PVC which also includes a mixture of nylon with aluminum, steel and/or plastic frames for support. Some of them are powered with paddles, oars with electric trolling motors using deep cycle lead batteries. More commonly they are equipped with motor mount, battery storage area, fishing rod holders, canopy, fishfinder mount, small anchor and other required fishing gear. When using pontoon boats with motor mount, the suitable places for enjoying sailing are ponds, lakes, rivers and seas during calm weather. However, because of the light weight, they are susceptible to waves and windy conditions. Nonetheless, the pontoon boat with motor mount are often used not only for handling big water but also big fish ! The Colorado XT by Classic Accessories is a 9′ pontoon boat that has a 400 lb capacity, flexible storage options, an integrated transport wheel that aids in moving the Colorado XT to the water and stows when you are fishing, and removable gear bags (with included shoulder strap) that provide customizable storage with 20 pockets and two insulated drink holders. See more details here. The Colorado inflatable personal pontoon fishing boat offers huge storage capacity; includes over 20 pockets and 2 insulated drink holders. Weatherproof motor mount. Wire rear storage and battery platform. Fishing rod holder can be mounted in 6 different positions. Integrated anchor system with fillable mesh bag, cord and pulley can be mounted from either side or back. Detachable foam fly patch. See more details on Colorado 9′ pontoon boat. Talk about the best of both worlds-with the Bozeman you can fish water in a fishing pontoon boat that otherwise might be accessible only by a float tube. It includes an entire eight-foot fishing pontoon boat, oars and a lightweight foot pump all of which fit into a comfortable and surprisingly compact backpack. On the Bozeman you will find everything you need for a great day of fishing. Fish anywhere! The entire fishing pontoon boat, oars and pump fit into a compact 45 pound backpack. The Hunter Green Stealth Stalker 10 is a new kind of fishing boat equipped for use in various fishing conditions… on rivers, lakes, bays…in calm or rough weather. Comfortable for two, easily handled by one! This roomy, portable, light weight boat features a fully enclosed hull for use on almost any body of water. Wide sectional floorboards provide plenty of fishing space and a conveniently located stow bag makes for easy access. The NEW Hunter Green Stealth Stalker 10 is a stealthy inflatable boat that’s perfect for Fishing or Hunting. More details on the Hunter Green Stalker here. The Oswego is the crossover of fishing pontoon boats, light and fast but with 10-foot pontoons that give you extra weight capacity. This big inflatable pontoon boat has a big supply of features and storage space as well. Multiple storage pockets include six oversized zippered pockets, two mesh pockets for small gear and two drink holders. In back there is a two-position motor mount for trolling and sturdy wire platform with room to lash a battery and a dry bag. See more details on the Oswego Pontoon here. The Bass Raider’s tri-keeled hull ensures excellent tracking and minimizes side slipping, while its beam gives stability and maximum carrying capacity. Sturdy 8′ pontoon boat with padded fold-down plastic seat, heavy-duty wire rear cargo platform, and over-the-lap stripping apron with fish ruler. 350 lb capacity. Ample armrest storage includes large central pockets, two sloped gear pockets and outside mesh pockets for small items or drinks. Fabric rear storage platform. Detachable foam fly patch. Comfortable seat with extra tall backrest conforms to the body. Footrests are adjustable. No tool assembly. Tow rings. Unique dual-side stripping apron allows entry and exit without unclipping. See more details on the Cimarron Pontoon Boat here. Sea Eagle’s 285 Frameless Pontoon Fishing Boat: The unique U-hull configuration of this one man fishing boat provides the maximum fishing space with the least amount of hull weight. This is a super lightweight, super portable fishing craft. The NEW Hunter Green 285fpb is a stealthy inflatable boat that’s perfect for fishing or hunting. It goes anywhere, sets up in just 5 minutes and can fit in the trunk of a car. Built to be used on remote ponds, small or large lakes, wilderness rivers, inland bays or saltwater flats. See more details on the Sea Eagle’s 285 Frameless Pontoon Fishing Boat here. 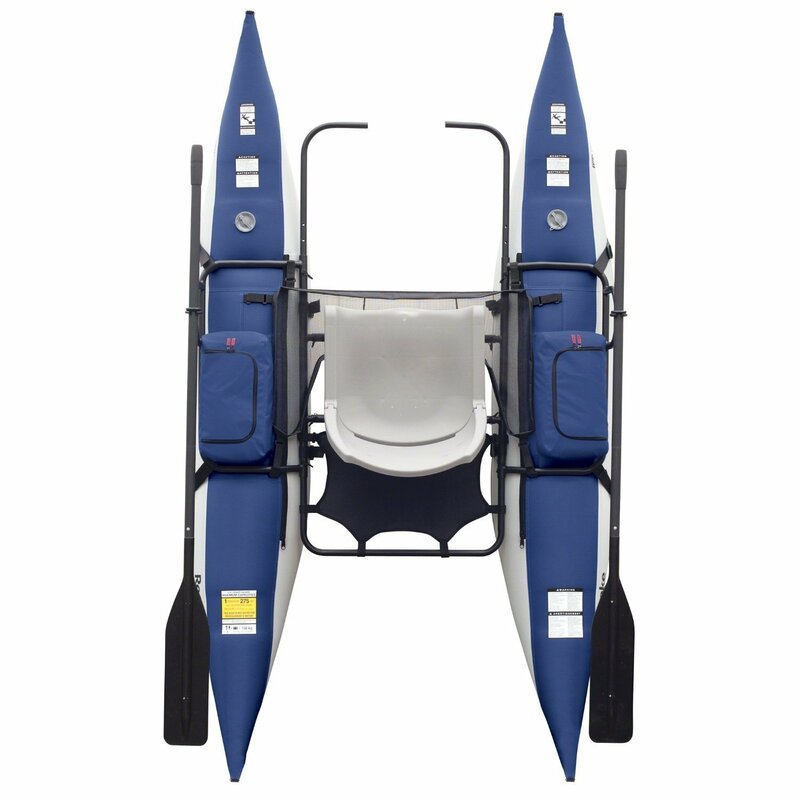 The PAC 900 is a size up from the PAC 800 and offers enhanced cargo room and stability for bigger water. This is not too big to be maneuvered by fin kicking, but not too small for overnight trips. Featuring heavy duty PVC, urethane bladders and a simple lightweight aluminum frame the PAC series boats are the best choice for anglers who want a boat to last for years to come. The PAC 900 is for you if: – You want a high-end 9′ pontoon boat – You love to fish rivers that have some rapids – You like to fish lakes and reservoirs – You like the feel of a pontoon boat with some rocker Boat Spes: Inflated Size: 54″ x 9′ Tube Diameter: 16″ Fabric: 1100 PVC Material Weight: 24/27 oz/sq.yd. AireCell Material: Urethane Seam Construction: Welded Warranty: 10 Valve Type: (2)Leafield B7 Weight: 54 lbs. Load Capacity: 400 lbs. Frame: 4-pc aluminum Anchor System: Included Motor Mount: Included Oar Type: 7′ 2-piece. See more details on the PAC 900 Pontoon boat here. The Endura C2 transom-mounted trolling motor is a legendary performer that will deliver years of use on the water. This small but mighty 12-volt motor offers 5 forward speeds and 3 reverse speeds, providing anglers with maximum control. the Mighty Max ML35-12 12 Volt 35 AH uses a state of the art, heavy-duty, calcium-alloy grid that provides exceptional performance and service life in both float and cyclic applications. Have you ever needed a private place to change clothes, take a shower or use the restroom? Now you can, with the Original “Pop-Up Room in a Bag”. The open top allows ANY height person to use without being cramped. The frame is made from dura-light steel for long-lasting use and weather-resistant material for any weather conditions. MAXSHADE COVERS® Trailerable Pontoon Boat Cover is made of marine grade polyester canvas with double PU Coating. This 300D polyester made boat cover designed for both long-term storage, mooring and highway travel.